This week on Terra Informa, we’re looking at the shiny element that has come to symbolize glitz, glamour, and gigantic mining controversies: gold. 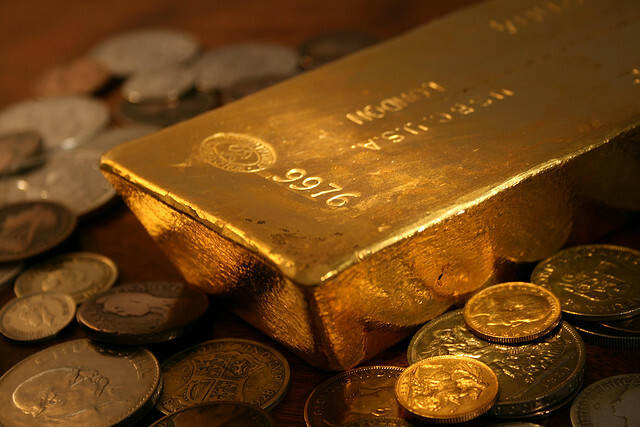 How did ancient societies bring gold up from the ground? Are Canadian gold companies good for Guatemala? We speak to a Guatemalan organization that focuses on land rights and mining, and feature Toronto-based singer-songwriter Caleb Lance’s song ‘Gold.’ And this week we’re welcoming two new volunteers: Annie Banks and Jess Warren. Get ready for a show that really shines. Shiny new volunteer Jess Warren brings us a look at the very first ancient gold mines in Mesopotamia, how much gold we’ve dug up worldwide, and some of the messy methods we use to extract it. Wonder no more about sluicing and heap leaching. Are Canadian gold companies good for Guatemala? Goldcorp is one of Canada’s largest gold-mining companies. Based in Vancouver, it has been operating extensively in Guatemala for the last decade. A study in November 2011 from Tufts University, Searching for Gold in the Highlands of Guatemala, Economic Benefits and Environmental Risks of the Marlin Mine found that Guatemala receives only 42% of the mine revenues, and local communities receive only 5% of revenues, while the environmental risks posed to local communities are exceptionally high. At Goldcorp’s recent AGM in April, a shareholder proposal was presented calling for Goldcorp to take responsibility for adequate closure of the Marline Mine, to ensure that Guatemalans aren’t left with the long-term costs of clean-up. Terra Informa correspondant Kathryn Lennon spoke with Oscar Lionel, with the help of a translator. Oscar is an employee of Ceiba, in Chimaltenango, Guatemala. Ceiba is a Guatemalan organization that focuses on land rights, mining and food sovereignty. She also hears from Valerie Croft, a member of the network, Breaking the Silence. Caleb Lance is a singer-songwriter based in Toronto. His music is influenced by his experience in the outdoors, he was a geography and environmental studies major at Wilfrid Laurier. This song you’re about to hear, Gold, was inspired by the story of a man in Malartic Quebec, who was forcibly evicted from his childhood home to make way for a gold-mine project, by Osisko Mines. This is Canada’s largest open pit mine.Caleb is set to release his debut album, Keep My Name. This song Gold, is off his new album. On Wednesday May 16, United Nations special rapporteur on the right-to-food Oliver De Schutter raised concerns about food security in Canada. De Schutter also raised concerns about Canada’s relations with Indigenous people. In his report De Schutter described “a system that presents barriers for the poor to access nutritious diets and that tolerates increased inequalities between rich and poor, and aboriginal and non-aboriginal peoples.” Federal Immigration Minister Jason Kenney and Health Minister Leona Aglukkaq called De Schutter “ill-informed” and “patronizing.” In contrast, president of Inuit Tapiriit Kanatami Mary Simon welcomed De Schutter’s findings. This week, the Harper government announced the closure of Canada’s Experimental Lakes Area. The ELA is a world-renowned aquatic research facility that has been providing the globe with award-winning water research for more than 40 years. The government claims it is closing the 40 year program simply because it does not fit with their mandate. The Indigenous Environmental Network and the Athabasca Chipewyan First Nation are launching an Indigenous-led campaign against Shell and its projects. A report, entitled “Risking Ruin: Shell’s dangerous developments in the Tar Sands, Arctic and Nigeria”was publicly launched on Friday, May 18th in London, England. The report profiles the Indigenous communities impacted by Shell’s projects in places like Alberta, Alaska and the Niger Delta. The Tahltan Nation has expressed opposition to the Red Chris copper and gold mine. In specific, the Tahltan Nation opposes the Province’s decision to issue a Mines Act permit to Red Chris. The proposed mine would be a 30,000 tonne per day open pit mine in the Todagin Plateau area of Tahltan territory. The mine would seriously damage Todagin Mountain and would turn a pristine valley and a lake into a tailings pond, according to a report from the Tahltan Central Council.